These beautiful flowers are extremely popular at the moment. They originate from Central and tropical South America, and are commonly known as Flamingo flowers. They come in a wide variety of colours including bright red, green, pink and white. One of my favourites is called 'safari' and is burgundy with pale stripes. The photo shows pink anthuriums which we arranged into a 'thank you' bouquet. Botanists will tell you that the brightly coloured parts are not flowers at all but modified leaves called spathes...but who cares! They look absolutely fantastic. Anthuriums can work well in bouquets, but be careful which flowers you put them with. Their size and unusual shape shout 'look at me' and they easily overpower other flowers. Let them be the star of the show with other flowers as secondary. They are also good in table arrangements. I created the centerpieces in the photo on the left with anthuriums and roses. The size of anthuriums is useful when creating large arrangements like a pedestal arrangement for a reception. Here I do mix them with other flowers and this works well in these larger arrangements. I made a short video here on anthurium tropical wedding flowers, if you want to learn more about these fascinating blooms. Orchids have long been a favourite with brides. There are a number of different varieties including Moth orchids (Phalaenopsis) and Cymbidium orchids. Phalaenopsis are delicate flowers that are well-suited to bouquets and also look good as buttonholes - as can be seen in the photo on the right. Cymbidium orchids are robust, and are one of the most versatile flowers. Cymbidiums have large heads but still retain a refined elegance. The popular colours are white, pink, yellow and light green. I have used them in tropical wedding bouquets, wedding boutonnieres, and in room arrangements. In fact, I just simply love using them! Heliconia is a beautiful architectural plant. For this reason you'll find it in the receptions of quality hotels and corporate offices around the world. It can be arranged into striking designs for wedding ceremony rooms and receptions. The yellow and red colours will brighten any room and make colorful centerpieces. I created the arrangement in the photograph using heliconia as the focal flower and flanked it with dark pink tropical ginger. Heliconia is originally from the tropical areas of Central and Southern America. It is transported by airfreight from countries like Costa Rica and is available year round. I was delighted to see this plant growing in the Palm House when I recently visited the world famous Kew Botanic gardens in London. It must be a truly awesome sight to see it growing in the wild. In addition to the colourful flowers, tropical foliage (leaves) can make a huge difference to your arrangements. They complement tropical wedding flowers but also work well alongside more traditional flowers such as roses and gerberas. Palm leaves, and Monstera (Swiss Cheese plant) leaves make an excellent base on which to create any type of large venue arrangement. You can see this on the photo on the right where I have used palm and Monstera leaves to give shape to this arrangement. 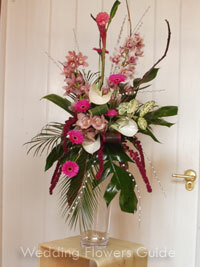 Tropical flowers including cymbidium orchids, white anthuriums and ginger were then added. Cerise pink gerberas add a final flourish to the arrangement. Strelitzia leaves can also form an unusual backdrop for your tropical wedding flowers. 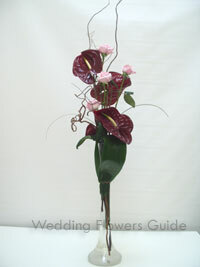 Foliage can be romantic too - Anthuriums have lovely heart-shaped leaves that are most appropriate for weddings.